Sierra Rica Organic Chestnuts, from the grocery section, are cooked and ready to use. 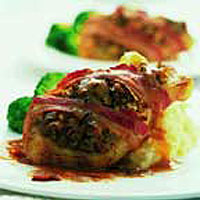 They are ideal for stuffings and this recipe is a perfect blend of chestnuts with pork, sage and bacon. Preheat the oven to 200°C, gas mark 6. Roughly chop the chestnuts. In a large bowl, mix together the chopped chestnuts, breadcrumbs, herbs, lemon zest, half the lemon juice and seasoning. Mix well. Press the mixture onto the top of the chops. Stretch 2 rashers of bacon and wrap them around each chop, tucking the ends under. Place in a roasting tin and bake for 30-35 minutes, until the chops are cooked through and the juices run clear. Remove the chops from the roasting pan. Drain off any excess fat, reserving the pan juices, then pour the fresh gravy, sherry and remaining lemon juice into the roasting pan. Bring to the boil on the hob and simmer for 2-3 minutes, then pour into a jug. Serve the chops with the gravy, mashed potato and broccoli. To stretch bacon, hold one end of the rasher and run the back edge of a knife along it. Please Note: Ensure the pork is cooked thoroughly, the juices run clear when pierced and there is no pink meat. Wash work surfaces, utensils and hands thoroughly after handling raw meat.